Stay comfortable year-round with this all in one air cooler, humidifier and ionic air purifier. This air cooler can reduce temperature by up to 25 degrees (per 200 square feet) and is especially effective when used with the humidifier. The air filter system is equipped with a built-in generator of negative ions that attract allergy irritating particles and pollutants, pushing them down and out of the air you breath. Individual settings (cooler, ionizer, humidifier) can be used independently. Adjustable air vents give you efficient cooling while the remote control lets you maximize your comfort from any place in the room. Comes with casters so that the unit can easily be wheeled to any room in your home. 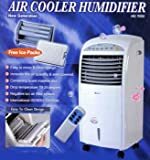 Cooling (Low/Mid/Hi): 45W/48W/52W Power Source: 100V/60Hz Humidifying Capacity: 0.4L/H Water Tank Capacity: 2 Gallon Timer: 7.5 Hours Wind Mode: 3 Selection Unit Net Weight: 25lbs. Air cooler humidifier, purifier, air freshener & pest repellent in ONE! !